Compound melanocytic nevus with architectural disorder and shouldering (S), or extension of the junctional component beyond the dermal nests of melanocytes (D). Rete ridges are irregular and distorted with bridging (B) and eosinophilic fibrosis (arrows). Scattered lymphocytic infiltrate is often present (*). See Atypical Mole (Dysplastic Nevus) for more information. Dysplastic (atypical, Clark) melanocytic nevi are common, pigmented lesions in adults, most prevalent in patients younger than 30-40 years; however, these lesions can appear in the elderly and prepubertal children. 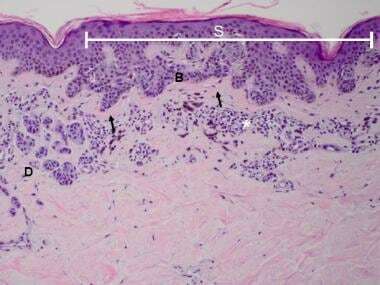 [6, 7] The immense majority of dysplastic (atypical, Clark) melanocytic nevi appear after birth, although some lesions with these histologic features also display findings that are characteristic of congenital nevi (arrangement around skin adnexa and vessels, involvement of arrector pili muscle). The clinical and histologic differential diagnosis of dysplastic (atypical, Clark) melanocytic nevi include common nevi, melanoma, Spitz nevi, nevi of special sites, and melanoma in association with a dysplastic nevus. Partial biopsies of large, pigmented lesions may show dysplastic nevuslike features. Small lesions with severe architecture or a subgroup of lesions on the lower leg may share features of dysplastic (atypical, Clark) melanocytic nevi and melanoma in situ. [11, 20] The presence of dermal mitosis and upward migration of intraepidermal melanocytes are not prominent features in dysplastic (atypical, Clark) melanocytic nevi, and if encountered in a melanocytic lesion, a thorough examination and ancillary studies may become necessary for further classification and diagnosis. The gross appearance of dysplastic (atypical, Clark) melanocytic nevi is similar to the clinical findings of an irregular, macular or papular pigmented lesion with ill-defined borders. Lesions typically show 2 differently colored areas ("2-toned" nevi), a central, slightly elevated (papular) component surrounded by a flat (macular) region. The erythematous base is better visualized in vivo. Nevi with architectural disorder (NAD) may be compound or junctional, and the histologic diagnosis requires a combination of architectural disorder and random cytologic atypia of melanocytes. The architectural disorder includes asymmetry, subepidermal fibroplasia, and a distorted rete ridge pattern with bridging between adjacent rete rides (see the image below). Compound lesions have extension of the junctional component beyond the dermal nests of melanocytes, referred to as shouldering. A host response with variable dermal lymphocytic infiltrate is frequently a component of NAD. Two histologic features of architectural disorder include: (A) concentric eosinophilic fibrosis (E), in which fibrosis encircles a rete peg; and (B) lamellar fibroplasia (L), in which the fibrosis is confined to the tip of the rete peg with stacks of collagen fibers. Nests of melanocytes in the dermal-epidermal junction demonstrate random cytologic atypia (arrows). Moderate cytologic atypia is defined as melanocyte nuclei as large as basal keratinocytes (1-2 times the size of basal keratinocyte nuclei), hyperchromatic, ellipsoid- or rhomboid-shaped, with a small nucleolus visible in the center of the nucleus. A 0.2-0.5 mm excision is recommended with NAD and severe cytologic atypia of melanocytes. Incompletely excised melanocytic lesions including dysplastic (atypical, Clark) melanocytic nevi may recur. HMB-45 and MART1 label intraepidermal melanocytes, and the extent of pagetoid upward migration of melanocytes in the epidermis may be detected with either of these antibodies. NAD should have a minimal degree of pagetoid cells in the epidermis and be limited to the central region of the lesion. HMB-45 primarily labels intraepidermal melanocytes along the dermal-epidermal junction and nests of melanocytes in the papillary dermis of NAD, and similar to most nevi, fails to label nests of melanocytes located in the deeper dermis. Furthermore, the pattern of HMB-45 reactivity is similar to morphologic changes of type A epithelioid melanocytes present along the dermal-epidermal junction and papillary dermis as well as type C spindle-shaped melanocytes located in the deep dermis. Banal melanocytic lesions display this maturation sequence from the papillary dermis with further descent into the reticular dermis with respect to cell morphology and reactivity with HMB-45. In contrast, melanomas will demonstrate absence of maturation of the dermal component and a patchy pattern of labeling with HMB-45. NAD exhibit less than 1-5% labeling with MIB1 (anti-Ki-67), and reactive cells are generally located in the superficial dermis. However, melanomas demonstrate a proliferative rate up to 16.4% with MIB1 and absence of an orderly pattern of labeling in the dermis. [26, 27] Double-labeling with MART-1/Ki-67 enhances the evaluation of proliferative index in melanocytes, especially in lesions with a high number of background lymphocytes. Diagnosis and treatment of early melanoma. NIH Consensus Development Conference. January 27-29, 1992. Consens Statement. 1992 Jan 27-29. 10(1):1-25. [Medline]. Halpern AC, Guerry D 4th, Elder DE, Clark WH Jr, Synnestvedt M, Norman S, et al. Dysplastic nevi as risk markers of sporadic (nonfamilial) melanoma. A case-control study. Arch Dermatol. 1991 Jul. 127(7):995-9. [Medline]. Sagebiel RW, Banda PW, Schneider JS, Crutcher WA. Age distribution and histologic patterns of dysplastic nevi. J Am Acad Dermatol. 1985 Dec. 13(6):975-82. [Medline]. Fernandez M, Raimer SS, Sánchez RL. Dysplastic nevi of the scalp and forehead in children. Pediatr Dermatol. 2001 Jan-Feb. 18(1):5-8. [Medline]. Tucker MA, Greene MH, Clark WH Jr, Kraemer KH, Fraser MC, Elder DE. Dysplastic nevi on the scalp of prepubertal children from melanoma-prone families. J Pediatr. 1983 Jul. 103(1):65-9. [Medline]. Halpern AC, Guerry D 4th, Elder DE, Trock B, Synnestvedt M, Humphreys T. Natural history of dysplastic nevi. J Am Acad Dermatol. 1993 Jul. 29(1):51-7. [Medline]. Naeyaert JM, Brochez L. Clinical practice. Dysplastic nevi. N Engl J Med. 2003 Dec 4. 349(23):2233-40. [Medline]. Mooi WJ. The dysplastic naevus. J Clin Pathol. 1997 Sep. 50(9):711-5. [Medline]. [Full Text]. Piepkorn M, Meyer LJ, Goldgar D, Seuchter SA, Cannon-Albright LA, Skolnick MH, et al. The dysplastic melanocytic nevus: a prevalent lesion that correlates poorly with clinical phenotype. J Am Acad Dermatol. 1989 Mar. 20(3):407-15. [Medline]. Torres-Cabala CA, Plaza JA, Diwan AH, Prieto VG. Severe architectural disorder is a potential pitfall in the diagnosis of small melanocytic lesions. J Cutan Pathol. 2010 Aug. 37(8):860-5. [Medline]. Puig S, Ruiz A, Castel T, Volpini V, Malvehy J, Cardellach F, et al. Inherited susceptibility to several cancers but absence of linkage between dysplastic nevus syndrome and CDKN2A in a melanoma family with a mutation in the CDKN2A (P16INK4A) gene. Hum Genet. 1997 Dec. 101(3):359-64. [Medline]. Reed JA, Medrano EE. Recent advances in melanoma research. Front Biosci. 2006 Sep 1. 11:3003-13. [Medline]. Curry JL, Richards HW, Huttenbach YT, Medrano EE, Reed JA. Different expression patterns of p27 and p57 proteins in benign and malignant melanocytic neoplasms and in cultured human melanocytes. J Cutan Pathol. 2009 Feb. 36(2):197-205. [Medline]. You Y, Wang SH, Zhang JF, Zheng SY. TSLC1 expression discriminates cutaneous melanomas from dysplastic nevi. Melanoma Res. 2012 Dec. 22(6):430-5. [Medline]. Metcalf JS, Maize JC. Clark's nevus. Semin Cutan Med Surg. 1999 Mar. 18(1):43-6. [Medline]. Cohen LM. Lentigo maligna and lentigo maligna melanoma. J Am Acad Dermatol. 1995 Dec. 33(6):923-36; quiz 937-40. [Medline]. Khalifeh I, Taraif S, Reed JA, Lazar AF, Diwan AH, Prieto VG. 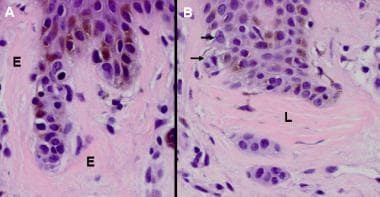 A subgroup of melanocytic nevi on the distal lower extremity (ankle) shares features of acral nevi, dysplastic nevi, and melanoma in situ: a potential misdiagnosis of melanoma in situ. Am J Surg Pathol. 2007 Jul. 31(7):1130-6. [Medline]. Cesinaro AM. Clinico-pathological impact of fibroplasia in melanocytic nevi: a critical revision of 209 cases. APMIS. 2012 Aug. 120(8):658-65. [Medline]. Arumi-Uria M, McNutt NS, Finnerty B. Grading of atypia in nevi: correlation with melanoma risk. Mod Pathol. 2003 Aug. 16(8):764-71. [Medline]. Culpepper KS, Granter SR, McKee PH. My approach to atypical melanocytic lesions. J Clin Pathol. 2004 Nov. 57(11):1121-31. [Medline]. [Full Text]. Shea CR, Vollmer RT, Prieto VG. Correlating architectural disorder and cytologic atypia in Clark (dysplastic) melanocytic nevi. Hum Pathol. 1999 May. 30(5):500-5. [Medline]. Rudolph P, Schubert C, Schubert B, Parwaresch R. Proliferation marker Ki-S5 as a diagnostic tool in melanocytic lesions. J Am Acad Dermatol. 1997 Aug. 37(2 Pt 1):169-78. [Medline]. Tucker MA, Halpern A, Holly EA, Hartge P, Elder DE, Sagebiel RW, et al. Clinically recognized dysplastic nevi. A central risk factor for cutaneous melanoma. JAMA. 1997 May 14. 277(18):1439-44. [Medline]. Shors AR, Kim S, White E, Argenyi Z, Barnhill RL, Duray P, et al. Dysplastic naevi with moderate to severe histological dysplasia: a risk factor for melanoma. Br J Dermatol. 2006 Nov. 155(5):988-93. [Medline]. Seykora J, Elder D. Dysplastic nevi and other risk markers for melanoma. Semin Oncol. 1996 Dec. 23(6):682-7. [Medline]. The authors and editors of eMedicine gratefully acknowledge the contributions of Dr Choladda V Curry to the development and writing of this article.